Happy Friday everyone! It's Mai here to ring in the weekend with a new post. Let's talk about Glossier's fragrance - You - and it's two available forms. How do they compare and contrast? Which one would be most ideal? The eau de parfum version of Glossier's first ever fragrance released on October 23rd, 2017 - which I think is perfect since it's a gorgeous cold-weather scent. Since Glossier is only available online for a huge amount of their customers (their only showroom is located in New York - where you can test out products in person), a lot of consumers were hesitant to drop $60 on a fragrance they had never smelled / worn before. Perfume sits and wears differently on everyone, and while $60 isn't terrible for a 1.7oz bottle of perfume .... it's still a risk a lot of people weren't willing to take - including myself. I love new fragrances just as much as the next person, but I really didn't want to take that financial leap without knowing that I loved Glossier You. Right off the bat, I had a hunch that I would love this. I love deeper, musky scents. I love when pepper is included in fragrance. I love ambrette/ambrox. So I figured I would end up having a deep love affair with You, once I finally got my hands on it. A lot of people recommended to first order a free sample of You with another Glossier order - which is what I did. Long story short, I was obsessed. It was everything I had hoped it would be. I hadn't loved a scent this much since first discovering Bal d'Afrique via Byredo. Moving on, this perfume also wears for a very long time on me. I will say that the actual scent slightly dissipates after a few hours, but I'll continue to get wafts of it every now and then throughout the entire day. I've also gotten endless compliments on how it smells on me - even after I can no longer smell it on myself. I now am on my 3rd sample size of this fragrance, and once I'm able to drop $60 on the full size, I definitely will. But for now ... I have credit card debt that I'm trying to handle lmfao. Moving on, let's talk about the solid compact version of You. This is a newer release - I believe it came out at the beginning of this month - and I immediately jumped on it. Priced at $22, I felt that it was way easier for me to make the leap and purchase, especially since I knew I loved this scent. I waited patiently for it to arrive in the mail. I ordered around Valentine's day, and although I was supposed to receive it exactly on the 14th, it arrived two days later. I dug into it, clicked open the heavy, luxurious feeling packaging, and took a long whiff - amazing. I love this. 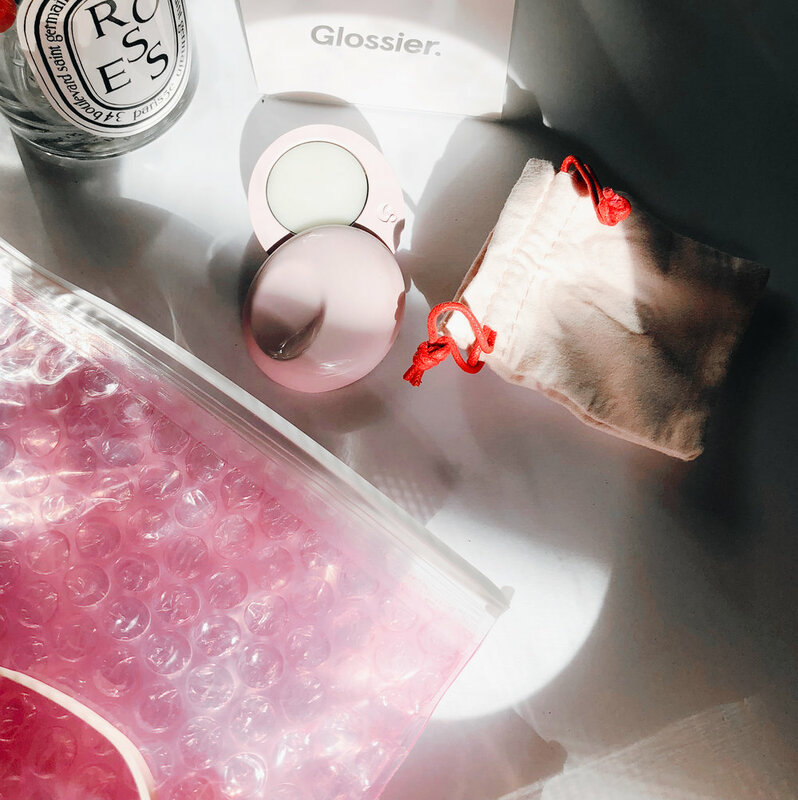 Glossier formatted the solid compact to be ideal for throwing in your purse (it comes with an adorable pink suede pouch) and going - touch ups available if you needed them throughout the day. They stated that this should last someone up to 3 months if used every single day. This is a more concentrated version of the original parfum, therefore the fragrance is a bit more potent. Glossier's eau de parfum sits on the skin and lasts throughout the day on me. I get stronger whiffs while wearing it, and others easily smell the scent on me (ex: the girl at my local juice bar that smelled it as soon as I walked up to the register to pay and told me how amazing I smelt) (my bf also loves it). The solid compact is more concentrated, but also more tame. I don't get as many whiffs of this, and I feel that it really sinks into my skin. I mainly smell this on myself, but others don't as easily, unless they hug you or put their face near the place you've applied (hey, you never know). All-in-all, I reach for my perfume samples more, but I do really love both, for different occasions. If you're looking for a little extra oomph, I'd say go for the parfum. If you want something subtly gorgeous, if you're sensitive to strong scents or work in a place where you can't be overly fragrant, go for the solid - it's just as beautiful bit a bit less forward. That'll be it for me this week! I hope this has helped some of you that were confused about which version of You to go for. Let us know which you like best - leave us a comment here or over on our IG page: @THEGLOSSARRAY.